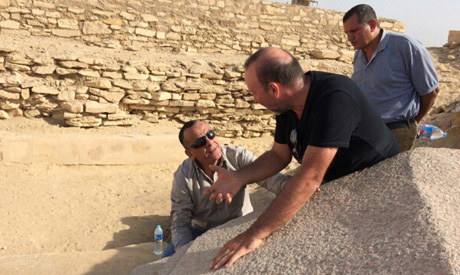 A Swiss-French archaeological mission at the Saqqara necropolis, directed by Professor Philippe Collombert from the University of Geneva, has unearthed the upper part of an Old Kingdom obelisk that belonged to Queen Ankhnespepy II, the mother of King Pepy II (6th Dynasty, Old Kingdom, around 2350 BC). 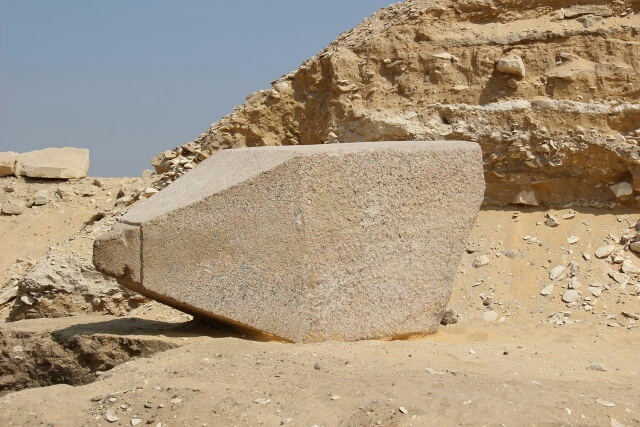 Collombert said that the part of the obelisk that was unearthed is carved in red granite and is 2.5 metres tall; the largest fragment of an obelisk from the Old Kingdom yet discovered. “We can estimate that the full size of the obelisk was around five metres when it was intact,” he said. 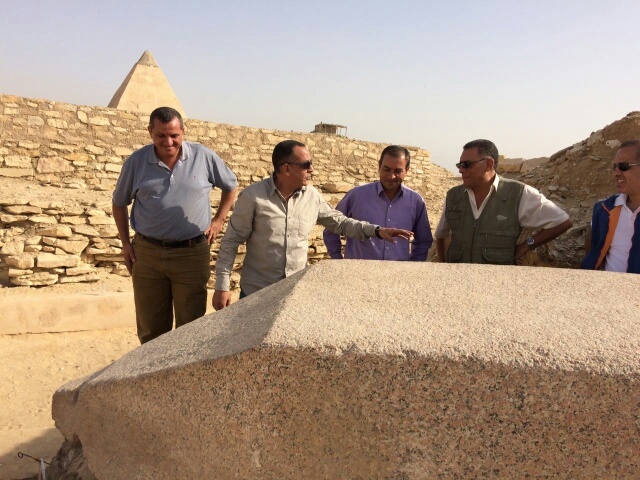 Mostafa Waziri, secretary-general of the Supreme Council of Antiquities, told Ahram Online that the artefact was found at the eastern side of the queen’s pyramid and funerary complex, which confirms that it was removed from its original location at the entrance of her funerary temple. “Queens of the 6th dynasty usually had two small obelisks at the entrance to their funerary temple, but this obelisk was found a little far from the entrance of the complex of Ankhnespepy II,” Waziri pointed out, suggesting it may have been dragged away by stonecutters from a later period. Most of the necropolis was used as a quarry during the New Kingdom and Late Period. Waziri said that the obelisk also bears an inscription on one side, with what seems to be the beginning of the titles and the name of Queen Ankhnespepy II. “She is probably the first queen to have pyramid texts inscribed into her pyramid,” Waziri said. He explains that before her, such inscriptions were only carved in kings' pyramids. After Ankhnespepy II, some wives of King Pepy II did the same. Collombert says that at the top of the obelisk, there is a small deflection that indicates that the pyramidion (the tip) was covered with metal slabs, probably of copper or golden foil, to make the obelisk glint in the sun. 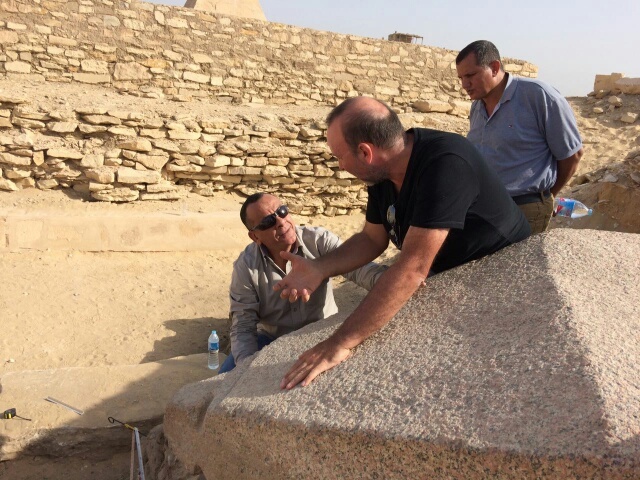 The main goal of the mission, which was established in 1963 by Jean-Philippe Lauer and Jean Leclant, is to study the pyramid texts of the Old Kingdom. Since 1987, the mission has also been excavating the necropolis of the queens buried in pyramids around the pyramid of Pepy I. This year, the mission is continuing work on the funerary complex of Queen Ankhnespepy II, the most important queen of the 6th dynasty. Ankhnespepy II was married to Pepy I, and upon his death, she married Pepy I’s son, Merenre, from her sister Ankhnespepy I.
Ankhnespepy II gave birth to the future King Pepy II. Merenre died when Pepy II was around six years old. Ankhnespepy II then became regent, and the effective ruler of the country, but did not go as far as to become pharaoh, as Hatshepsut did later on. “This is probably why her pyramid is the biggest of the necropolis after the pyramid of the king himself,” he said.